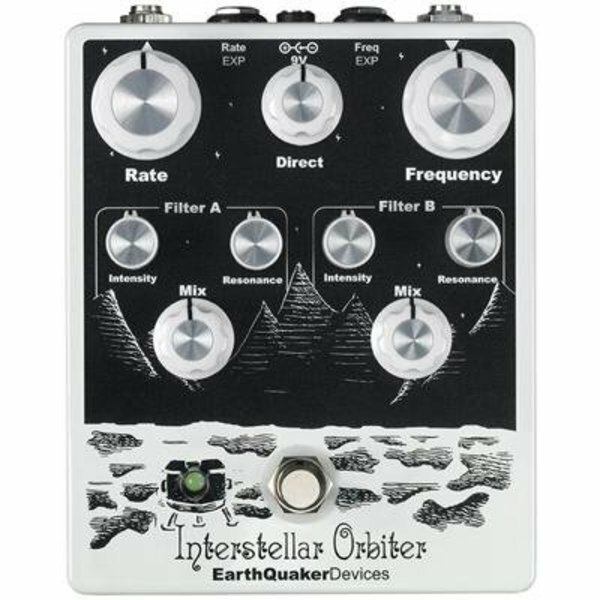 The Interstellar Orbiter is a dual resonant filter controlled by a single LFO that sweeps each filter in opposite directions. The Interstellar Obiter was specially designed for Kid Koala to be used on his Satellite Concert tour. The idea for the Satellite concert is very ambitious: each audience member will be seated at one of 60 mini turntable stations that will include a small crate of color coded custom vinyl. Each record contains a drone that is designed to harmonize with key moments in the show being performed on stage by Kid Koala. Each record player will be run through an effect pedal and allow the audience to individually manipulate the sounds in real time.... I mean, how could we say no to that!?! After a lots and lots of testing the records through various types of effects, we landed on the Interstellar Orbiter! So what is it? The Interstellar Orbiter is a dual resonant filter controlled by a single LFO that sweeps each filter in opposite directions. It has three universal controls: a master Frequency control that governs the center frequency of both filters, a master Rate control for the LFO and the Direct control for blending in the unaffected dry signal. There are expression pedal jacks for both the master Frequency and the LFO rate. The LFO sweeps each filter in opposite directions and has a wide range. Each filter is voiced differently and has controls for LFO intensity, resonance and mix. When the LFO Intensity is raised the filter sweep is wider, the center frequency is raised and the resonance becomes more pronounced. The resonance becomes more "ringy" as you dial it up and more mellow as you dial it back. The mix control adjusts the volume for the mix of each filter. With all of this control, the Interstellar Orbiter is a knob twiddler's dream with loads of possibilities! It can do everything from wah emulation to complex vocal formant filter and even a fairly convincing rotary speaker effect. You can set the intensity of both filters to zero and use the Frequency to manually create wide filter sweeps or use an expression pedal for a unique wah tones. Adjust the intensity of one filter to taste and use an expression pedal to sweep the second to create some awesome moving center point phase effects. You can also create some very vocal sounds by using the LFO to control both filters and fine tuning the resonance, intensity and master frequency. These vocal formants will vary depending the settings of each individual control and the rate at which they are swept! These are just a few suggestions, the Interstellar Orbiter is vast; get ready to get free. The Interstellar Orbiter is all analog, true bypass and hand made one at a time, part by part, knob by knob, wire by damn wire in the fiery town of Akron, Ohio and features artwork drawn by Kid Koala himself!